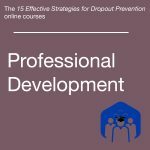 If you are interested in learning more about the courses, and would like to preview a course, please email ndpc@dropoutprevention.org. Courses can be purchased individually as well as in bulk through the NDPC store. Active learning implies engaged learners and students who embrace school. 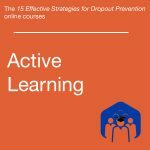 Learn more about how active learning can influence students in their decisions to remain in school. After-school and out-of-school opportunities, camps, and clubs provide students with extended time for academics, hobbies, interests, and relationship building in safe locations. Examine the research and learn how these high quality programs can impact graduation rates. Different students have a variety of unique needs. One of the most important alternatives to graduating from a traditional high school is graduating from an alternative school. Learn more about how high quality alternative school programs keep students in school and some of the characteristics of these programs that make the difference. Career and technical education provides students with relevance and excitement in entering adulthood, grounding them in skills they need to become productive and skilled citizens. Implemented well, career and technical education programs can provide students with a vision for the future, and give them reasons to stay in school. Learn more about how successful career and technical education programs keep students in school. 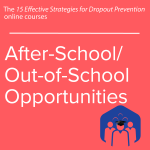 Dropout prevention starts before students arrive to school. 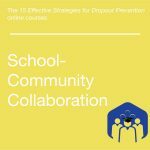 Learn how you and your community can be proactive in decreasing your dropout rate years in advance. 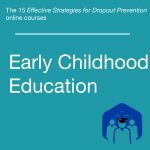 Early literacy makes a difference in dropout rates. 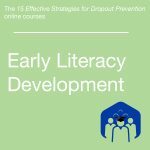 Learn the importance of early literacy and how community and school organizations can work together to help students develop early literacy skills at home and at school. Educational Technology as a tool in providing relevant and engaging student instruction can build a captive audience and keep students in school. Also as a tool to prepare students for college and career, educational technology can be used to support deeper thinking, more complex reasoning, and student buy-in to education. Learn more about how educational technology can be utilized as an engagement tool and more in the classroom. Family support is one of the top influencers of students who do graduate, but family engagement can be difficult to attain at times. Learn about some creative ways schools and districts reach out to their parents to form a unified bond for their students. 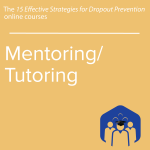 Well implemented mentoring and tutoring programs help many students get back or stay on track for graduation. Find out how you can implement a high quality program for struggling students who might otherwise derail to dropout status. Personalized learning strategies are often the solution to a disengaged student’s barrier to successful high school completion. 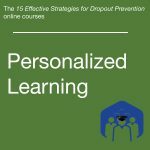 Learn how you can individualize instruction for personalized learning to recapture disengaged students and increase your graduation rate. Continuous high quality professional development around research-based strategies can increase student engagement and staff competencies. Find out how your school and district can mirror ESSA-supported professional development focused on student success in schools. Learning something new involves risk. Students are most invested in learning in environments that are physically, emotionally, and academically safe. Learn how you can create and sustain a safe learning environment in which your students thrive. The school-community alliance can make a powerful impact on a graduation rate and the livelihood of the community as a whole. Find out how these alliances can be grown and the impact the resulting increased rates have made in other communities. Service-learning is a highly engaging form of learning that is somewhat directed by the student. Learn more about how service-learning can help your potentially disengaged students involve themselves in something that truly matters to others through service. An “all systems on board” approach provides alignment and change required for a school and community to work together in making sure all students graduate. Learn about how this has happened in many communities and their remarkable results in graduation rates. 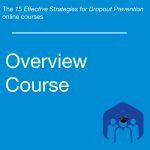 This course provides an overview to the 15 Effective Strategies for Dropout Prevention, information and examples to aid in understanding how the strategies work in relation to one another when implemented, and tools to support and engage educators to address the needs of every student and to help increase graduation rates. This course is longer than the other online courses, and can be completed in about 6 hours.